It's "Little Red Riding Hood" in reverse: Chief Grizzly (Xzibit) and Detective Bill Stork (Anderson) investigate a break-in at Granny's house (Close voices the ancient lady). The prime suspect: Red (Hathaway) herself! $16.879 million on 2394 screens. 2006’s Hoodwinked wears its influence on its sleeve. 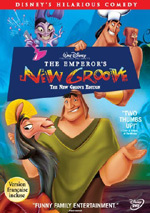 The DVD’s cover quotes a critic who claims it’s “the funniest animated movie since Shrek!” In addition, the movie offers a twist on standard fairy tales ala Shrek. The two flicks lack one commonality, though: box office success. 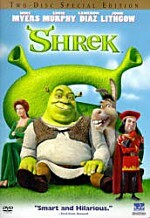 Shrek took in a massive $267 million back in 2001 and spawned an even more successful sequel. On the other hand, Hoodwinked made a lackluster $51 million and seems unlikely to turn into a franchise. I never thought Shrek or its sequel were all that terrific, so I was curious to see if I’d like Hoodwinked any better. The flick concentrates on the tale of Little Red Riding Hood. The story picks up with the confrontation between Red (voiced by Anne Hathaway) and the Big Bad Wolf (Patrick Warburton) at Granny’s (Glenn Close) house. After the Woodsman (Jim Belushi) intervenes, we then see the site as a crime scene. Chief Grizzly (Xzibit) runs the operation, but a froggie investigator named Nicky Flippers (David Ogden Stiers) digs below the surface. There’s a problem with the Goodie Bandit, and the authorities feel that this case may be related. After that the movie goes all Rashomon on us. We hear four different versions of what happened as we get stories from Red, the Wolf, the Woodsman and Granny, and then follow events from there. Maybe this is the expectations talking, as I didn’t really think I’d get much from Hoodwinked. I know I went into Shrek with a much higher level of anticipation, so that left more room for disappointment. Since I didn’t have high hopes for Hoodwinked, it couldn’t fall too far. That said, I thought Hoodwinked offered a consistently entertaining flick. It clearly came cut from the same cloth as Shrek since it offered a modern and ironic take on traditional tales. However, whereas I thought Shrek tended to use folk tale gags as an end unto themselves, Hoodwinked blended its comedy better. Much of the time, I felt Shrek threw out pop culture references for their own sake and they didn’t always make sense inside the story. Hoodwinked tends to make the elements mesh more smoothly. Sure, it goes off onto some odd tangents – especially related to the Granny character – but these feel surprisingly natural. They fit into the tale well and make the allusions less jarring and more effective. Hoodwinked also offers delightfully quirky characters. The twists we see in the main roles are fun, and the supporting personalities add a lot of life. I like Japeth the singing mountain goat, and Twitchy the squirrel is also a riot. Thankfully, the movie doesn’t milk these characters beyond their basic worth. It realizes that they could get tiresome with overexposure and keeps their usage within the boundaries of logic. While not packed with “A”-list stars, the cast of Hoodwinked brings a lot to the table. Actually, I’m glad it avoids the superstar voice actor syndrome. Too often movies use big names for their box office potential and don’t cast based on character or acting ability. Virtually all of the performers here fit their roles and make them more effective. I will admit it took me a while to get used to the visual style of Hoodwinked. On one hand, I like the pop-up storybook look to the sets. The film derives a nicely three-dimensional feel from those and creates a unique appearance. On the other hand, the characters themselves often looked quite odd. The humans were the strangest of the bunch, as they resembled ceramic figurines come to life. This made Red and the others seem awfully stiff at times, and that factor occasionally threw me out of the movie. This occurs for a logical reason: budget. Much less money propped up Hoodwinked than the average CGI extravaganza, and that shows in the awkward animation. This movie lacks the resources to present animation commensurate with modern standards, so it often looks fairly primitive. I know that this factor really bugged a lot of critics, and I can understand their concerns. That said, I’d much rather watch a film with lackluster animation and a fun story than see something technically proficient but dull. As I watched Hoodwinked, I paid less and less attention to the dated visuals because I simply enjoyed what the tale and characters. Yeah, the film drags a bit as it transitions from second act to the third, and a few other deficits occur. Nonetheless, the movie boasts a low-key quirkiness and sense of humor that allow it to become entertaining. 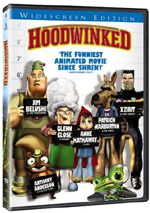 Hoodwinked appears in an aspect ratio of approximately 1.78:1 on this single-sided, double-layered DVD; the image has been enhanced for 16X9 televisions. This was a terrific little transfer. Sharpness looked excellent. The movie boasted a tight, crisp presentation from start to finish. I noticed no signs of softness on display here. Jagged edges and shimmering were absent, and I saw no examples of edge enhancement. Print flaws were also totally absent in this clean presentation. Colors were another highlight. The storybook setting offered plenty of chances for lively, dynamic hues, and the movie capitalized on them. The hues were always vivid and vibrant. Blacks seemed deep and full. While low-light shots offered great delineation and clarity. The movie consistently looked great. Although it didn’t live up to the visuals, the Dolby Digital 5.1 soundtrack of Hoodwinked seemed more than acceptable. I will admit I thought the soundfield could have boasted a more immersive sensibility, though. While it used all five channels to good effect at times, it let some prime opportunities pass without the expected level of information. For example, an avalanche stayed focused in the front and didn’t swallow up the soundfield like it should. Nonetheless, I thought the soundscape was generally quite solid. The movie offered enough information from the various channels to make it work. Elements were appropriately placed and they blended together quite smoothly. Although I thought they could have been more active, the surrounds still helped flesh out the package. They brought a lot of good support to the mix. Audio quality was terrific. Speech always seemed natural and concise. Effects were tight and detailed, and they boasted nice low-end when necessary; explosions and the avalanche added a lot of bass. The music also sounded full and dynamic. Some of the hip-hop tracks threatened to bust my subwoofer as they showed deep, rich low-end. This track just narrowly missed “A”-level consideration, as it was consistently quite good. A few extras fill out the disc. We open with an audio commentary from writers/directors Cory Edwards, Todd Edwards and Tony Leech. All three sit together for their running, screen-specific discussion. Though not always heavy on details, they turn this into a fun and generally informative piece. We get a look at the basics. The commentary covers cast and characters, story and editing, visuals and animation specifics, references and influences, sound and music, and the challenges of creating a CG feature on a very limited budget. 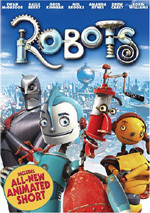 That subject proves the most interesting as we learn how they made a movie like this on a “Pixar Lite” amount of money. On the negative side, we get a little too much happy talk and praise here, and the track suffers from occasional gaps despite the brevity of the film. Nonetheless, the commentary usually proves lively and engaging. The directors offer a lot of quirky humor along with their information, and that helps make the track fun and enjoyable. Five Deleted and Extended Scenes last a total of nine minutes, 35 seconds. This area comes with a misleading title, as all five clips offer extended segments. All except for “Bat Scene” present elongated songs and come in final animated form. “Bat” includes more of Wolf and Twitchy in the caves and introduces deleted bat characters. I actually like the longer songs and think those versions might have belonged in the final flick. “Bat” was a good cut, though; it just isn’t entertaining. We can watch these with or without commentary from Cory Edwards. He gives us some basics and lets us know why they dropped these elements. His notes add decent insight. A featurette called How to Make an Animated Film follows. This 12-minute and 50-second piece includes movie clips, behind the scenes materials, and interviews. We hear from Cory Edwards as well as producers David Lovegren and Sue Bea Montgomery. They trace the film’s origins and development along with other aspects of the production. They also go through character design, storyboards, storyreels, and their usage in the planning processes, cast and performances and animation. Though “Make” never stretches beyond the basics, it covers them pretty well. Our glimpses of the candid footage helps, especially when we see the demo reels Edwards created to help the animators. We find some nice materials in this concise little show. Called “Critters Have Feelings”, a music video comes next. This one combines performance shots of a Cars-style tune with a minor storyline. That’s nothing special, but since the fully animated clip comes with a lot of new material, it becomes more entertaining than expected; it doesn’t just recycle film footage. Finally, the set includes the theatrical trailer for Hoodwinked and an ad for Doogal opens the DVD. While I can’t call Hoodwinked one of the all-time great animated flicks, it offers a substantially more entertaining experience than I expected. I admit I went into this one with reluctance, but I found it to be consistently enjoyable. Frankly, I prefer it to the two Shrek films. It feels like a better-integrated story with more interesting characters and funnier gags. The DVD presents excellent picture and sound as well as a decent collection of extras. Hoodwinked deserves a look.